Thetis, who has just foaled a LOPE DE VEGA filly. The Group 2 Rockfel Stakes placed THETIS, who will be offered as the final part of the dispersal of Ballymacoll Stud at the forthcoming Tattersalls February Sale, has foaled a LOPE DE VEGA filly. The daughter of INVINCIBLE SPIRIT out of the DAYLAMI mare SERRES is a half-sister to the Group 3 Tattersalls Musidora Stakes winner LIBER NAUTICUS and hails from the Ballymacoll family that includes Group 1 winners CONDUIT, GLASS HARMONIUM, BLOND ME, RIVER DANCER, SPECTRUM and PETRUSHKA. THETIS and her bay filly foal, who was born on 13th January, will be offered without reserve as lot 149 on the first day of the Tattersalls February Sale. The pair will be available for inspection at the Irish National Stud and at Park Paddocks in Newmarket. 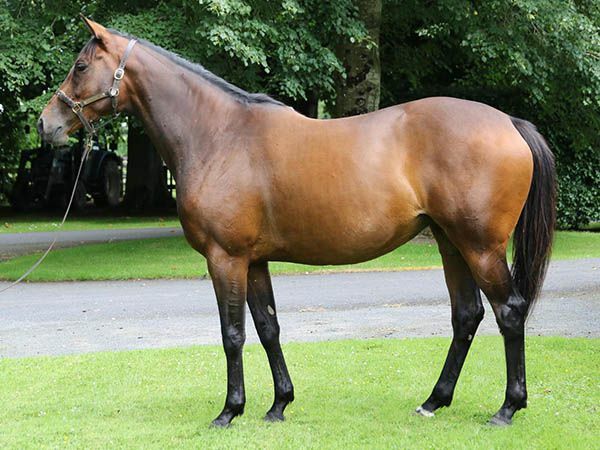 Those interested in inspecting her prior to the sale should contact either Peter Reynolds on +353 86 2518736 or Bill Dwan on +353 87 6485587. The two-day Tattersalls February Sale takes place on Thursday, February 1st and Friday February 2nd. Catalogues are available now from Tattersalls ,Tattersalls representatives and online at www.tattersalls.com.